My sister helped me regain focus and concentrate on the task at hand. I walked into that third round 10 points down, but I knew I was going to be walking out winning. Desire and willpower took over. I scored 3 points, then 1 more. Then I lost 3, by this point we were in the last ten seconds of the match. I literally had no time. There’s a famous quote by Bruce Lee that says, “Empty your mind, be formless. Shapeless, like water. If you put water into a cup, it becomes the cup. You put water into a bottle and it becomes the bottle. You put it in a teapot it becomes the teapot. Now, water can flow or it can crash. Be water, my friend.” And that’s what I did. Instead of giving in to the stress and frustration, I let my body and mind flow. The next thing I knew, I was standing over my opponent who was on the ground. The referee did an 8-count, looked over at me and announced me the winner. I had won in the last few seconds by knock out. 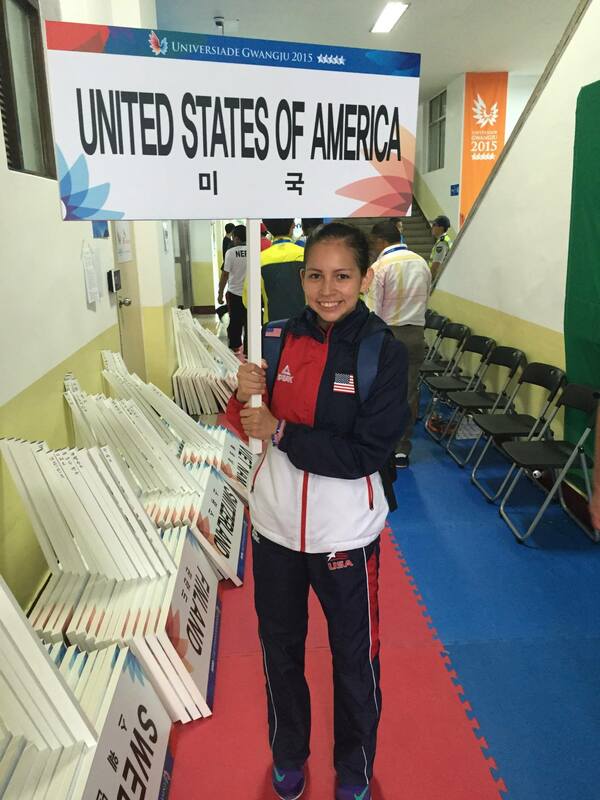 I had achieved my goal of making the US Collegiate National Team and representing the US at the World University Games that would be in Korea in a few months. And to top it of, I was named Female Athlete of the Year. I was ecstatic. These are the type of goals that I train every day for. 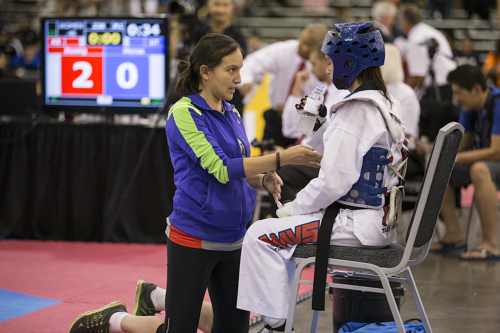 My training to prepare for competitions is twice a day for about an hour and a half each session, six days a week. I always take one day off to recover and keep my life in balance. 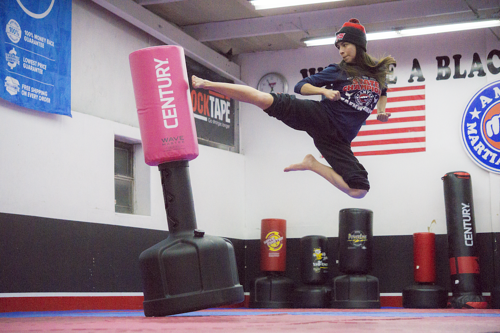 Training varies and can consist of Taekwondo-specific workouts like paddle kicking or hogu drills, visits to the weights room and gym with my strength and conditioning coach, sprints, stretching, resistance training, and more. Besides training, I balance my time with school (I’m a senior in college this year), teaching at my family’s martial arts schools, and managing my social media. I recently started a YouTube channel and have fallen in love with sharing videos that can reach and help so many people. Another big part of training is how I eat. I fight in the -46kg Finweight Sparring division, so I have to maintain that weight as I weigh in at every competition. I don’t ‘diet,’ but instead I make healthy choices in what I eat everyday as I want to keep my body strong and healthy. Competing thus far has been an incredible experience and I’ve loved traveling the world to represent the US. I would recommend it to anyone who is up for a challenge and has a love for learning. The biggest success I’ve found hasn’t been in the medals I’ve won, but rather in the lessons I’ve learned and strong mindset I’ve developed. 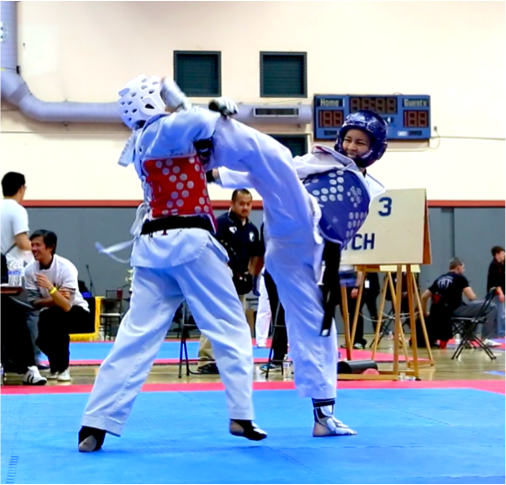 I hope to continue competing and growing as an athlete and pursuing my passion in this martial art.